I’m Heather Smith, and my goal for BarrelRacingTips.com is to deliver more value than you ever dreamed possible by offering education, inspiration and implementation you can use immediately to get RESULTS. Essentially, I’m here to help you WIN. Before we go further, I’ll say that in my book, a winner takes personal responsibility for revealing the greatest potential within themselves, and is committed to developing their ability to reveal it in each horse they throw a leg over. Winning is more than a destination, for me it encompasses a way of developing barrel horses that creates positive results in the arena, while also keeping the horse’s long term mental, emotional and physical well-being in mind. To sum it up – I believe in principles and methods that allow BOTH human and horse to WIN. This passion leads everything I do, and is at the forefront of all the educational resources I offer. That’s not where it ends, however; because I do also love the challenge of competition. Competing is about striving to be the best at a given time, on a given day, under a certain set of circumstances that we don’t have control over. 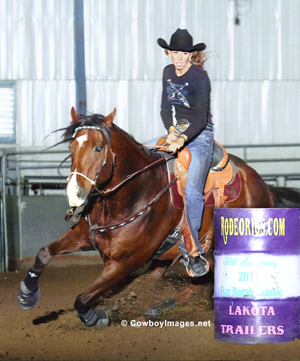 Add SPEED to the mix and it’s safe to say that barrel racing is not only a thrill, but is the ultimate test of connection between horse and rider. It’s an opportunity to take something great, and make it even better. My greatest lessons were learned the hard way. When I realized what DID work and why, it ignited a passion for sharing these secrets with the barrel racing world, and thus BarrelRacingTips.com, and my best-selling book series was born. I’m committed to bringing you not only the support, tools, knowledge, skills and more, that weren’t available or accessible many years ago, but resources that even in today’s age, aren’t available anywhere else. The learning opportunities I provide are intended to help barrel racers of all levels learn to solve problems at their source, rather than mask symptoms. 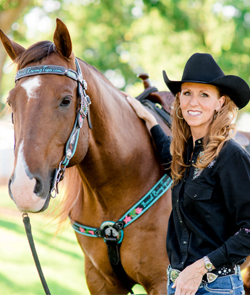 I’m dedicated to offering the quality, effective and easy to understand information necessary not only to train and maintain a barrel horse, but to help you reveal the greatest potential within yourself AND your horses. The resources I share are not based on one person’s opinion of what works, but are based upon ways of communicating with horses that they instinctively understand. I have found time and again, that when we focus in the right areas and ‘take the time it takes’ to develop our horses and our own foundations, we get a lot further, a lot faster. In the process, limitations are replaced with endless possibilities. What sets BarrelRacingTips.com apart even further is not just the fresh, eye-opening, and results-generating content I share, but HOW it’s delivered – which is positive, inspirational, and FUN! Thank you so so much, I cannot tell you how much your articles and emails have helped me. 🙂 - Anna W.
In invite you to sign Up below for weekly WINNING TIPS and visit often. You’ll ALSO receive a copy of The Guide to Independence on the Barrel Pattern featuring 12-time NFR barrel racer, Kay Blandford – my gift to you! I’m always adding to the unique collection of books, articles, videos and more found here, developed just for you – inspiring you to learn, grow, and LET GO of what’s holding you back. When you’re looking for something specific, see the category links in the right column on the Articles + Videos area, and feel free to utilize the search bar in the upper right corner. If YOU are ready for a change… if you’re ready to achieve REAL, lasting success IN and OUT of the arena, then you’re in the right place. Download song, “Ready for a Change” by Katie Drake on iTunes.